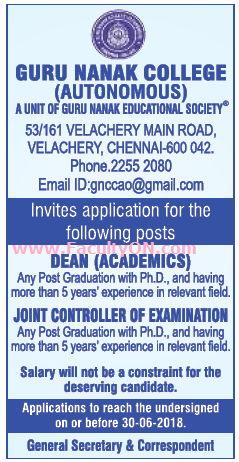 Guru Nanak College, Chennai has advertised in THE HINDU newspaper for recruitment of Dean / Joint Controller of Examination jobs vacancies. Interested and eligible job aspirants are requested to apply on or before 30th June 2018. Check out further more details below. About College: The Guru Nanak College was established in the year 1971 as a Unit of Guru Nanak Educational Society to mark the 500th birthday of the great mentor, Shri Guru Nanak Devji, the founder of sikh religion. The objective of the college is to spread the ideals of Universal brotherhood, oneness of God, communal harmony and welfare to all communities. The College is being run as a minority community college within the meaning of articles 29 and 30 of the Indian Constitution.